This is a nicely curved, guaranteed real Sperm Whale tooth that is registered with the Department of commerce as number 21-230-0010. It weighs 174 grams. This is, if course, a Sperm Whale's tooth signed on its back by M.M. Cohen. It is polished all the way around. Its front side is delicately etched in dark black with a portrait of the historic Yacht America. In August of 1851, the Yacht "America," which was designed by George Steers for John Stevens, Commodore of the New York Yacht Club, handily beat 14 British competitors in a 53 mile course around the Isle of Wright. America was 92.5 feet in length overall, had a 22.5 foot beam, and carried 5263 square feet of sail. She displaced 170 tons. Altough she didn't do too well at the start of the race, she quickly passed all the other ships in the Royal Squadron to win the "Hundred Guineas Cup," now known as the "America's Cup," still the premier nautical trophy in the world! The ship is held in a cartouche of rope which also encloses a yellow sun. It's etched with the "stipple technique." The tooth is 5 1/2 inches long along its outer curve and 1 3/4 inches wide at its base. 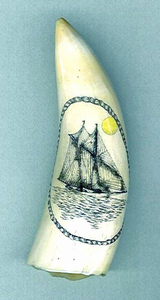 This striking tooth will be a stellar addition to any scrimshaw collection!